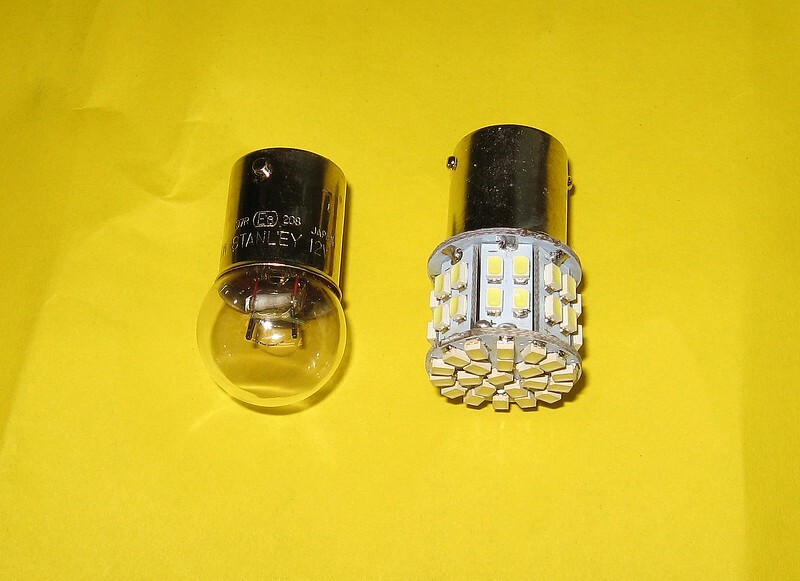 A number of years ago, someone had put out a replacement for the C10’s 2 rear incandescent bulbs with a small PCB insert that fit in behind the lens, and had an array of LEDs placed on it. Normal tail light illuminated a group of the LEDs, and putting on the brakes illuminated the rest. The system had a switch to allow for either a solid brake light or a 3-5 second pulsation, then would then go solid. This is similar to the Happy Trails WOW system for the KLR, if you're familiar with those. Are these things still out there and available? I vaguely remember seeing those, IIRC the pattern was kinda "X" shaped... didn't Gary the Murph sell them for a while??? Murph did have them, not sure if they are still available. Been reading "Man of Blues" posts to much lately or getting tired. I thought he posted "that he was getting sterile" I did a reread of Richard's post!! Was kind of wonder if he wasn't getting a little personal!! I may be getting old, and the count may be down... but pleeeeeze..
Didja by any chance ever watch Ted 2 ? But yes, it is my understanding that Murph did have a similar critter but it has since been discontinued. Quite honestly, I wasn't aware of his offering. Must have come out about the time I was fooked up with the imbalance thing. The one I am thinking of was out way earlier.... like in the mid to late 2000 decade. I saw a number of them operating at some of the rallies I attended back then, and even advertised s-o-m-e-w-h-e-r-e, but my own senility has crept into the picture...... you know, the CRS syndrome thing. Oddly enough, I was just yakking with another off line that I still have a copy of the program I used to lay out 75+ PCB boards back when I was a working stiff. This was before they put me in systems development and management. Unfortunately, cranking out a one-off board to replicate a similar design would be cost prohibitive for an individual. Back then I could piggyback side project stuff on our production prototype boards. This was also waay before MOB came on board to a later iteration of the same company. I need to drag that thing out to see if it runs on Win7. It was a DOS based program originally, and they eventually migrated it into early Windows systems. That’s about the time I was transferred to a different responsibility and board design and layout went to another individual. Those were fun times back then. Can you control an LED array with the vacuum tubes that that program was designed for? Actually, I don’t think there were any vacuum tubes in the basic schematic parts library. Lots of TTL and CMOS stuff. A part that wasn’t there, you could create. Ditto that with the physical stuff. Had to make a lot of symbols as new stuff was coming out all the time. It could also handle through hole and SMT symbols. It was kinda fun watching a router address the rats nest to route a board. Of course, you had to take care of the paths the router couldn’t figure out. Multi layer boards and ones with multiple copper planes presented a whole new challenge. It was an interesting time. the Murph thing was around mid 2000's, just after I became "enlightened" by you,and only lasted maybe 3-4 years, but the conversion lamps were dropped well before you and I had the vertigo thing going on. give him a call, I'm sure he would love to talk at'cha. I have the brake light flasher module in the tail light on my '05 C10. They are not to be found anymore. There are other flasher modules available. A neighbor bought one that installs in the wiring to the tail light and although it was supposed to work with incandescent as well as LED, he found that the incandescent bulbs weren't on long enough to light up sufficiently and he had to change bulbs to LED. Works fine now. That would be SuperBright LED's, $4.95 LED flasher module, but it only uses the two OEM light sockets, no additional led strip lights are included but of course it's a simple add-on if you want to go that route. 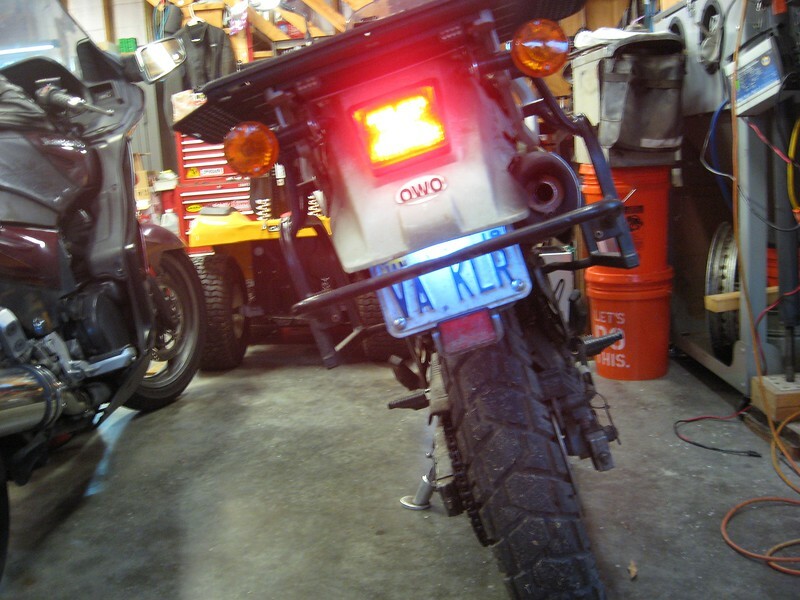 I know we’ve been discussing going the LED tail/stop light scheme route for the C10, but I have been dealing with that same issue with my ’02 KLR due to its limited power reserves, especially if you’re planning on using heated gear, adding grip heaters, etc. 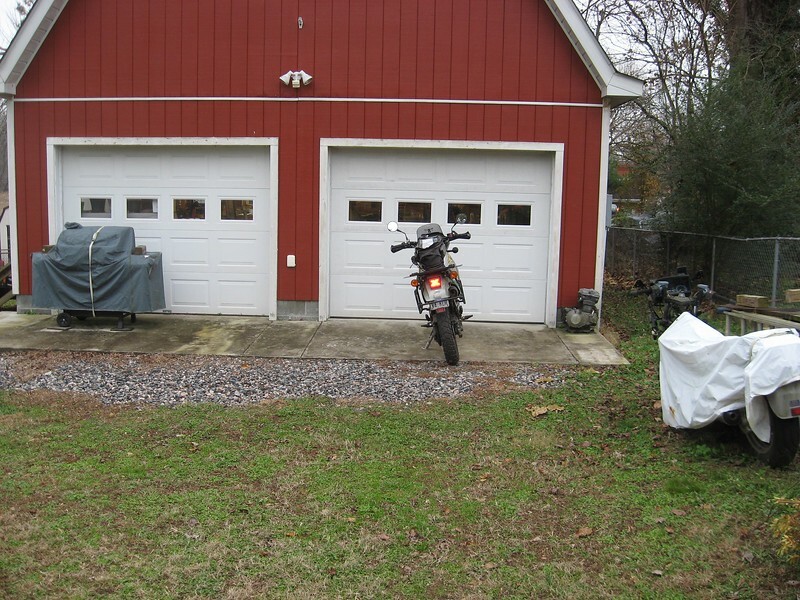 The ZZR alternator took care of all of those concerns with my C10, but that option doesn’t exist for the KLR. I’ve been addressing that with an excellent LED head lamp conversion bulb – finally – after a number of failed attempts, and will take care of the license plate bulb with an LED replacement that is on order. Not too concerned with the instrument or turn signal bulbs, mainly since the latter are used intermittently and shouldn’t have an overall affect. Since Murph’s LED tail lamp board is no longer available, nor can I find any reference to the mystery counterpart that used to be out there in years past, the Studebaker Corp. version for the KLR from http://www.klr650.com/Ledtaillight.htm might just work. It, too, is a PCB with a red LED array, a couple of DIP switches to adjust the strobe or no strobe time and functions, and a couple of mounting tabs on opposite sides that are pinched between the lens reflector and the lens support screw bosses. It’s slightly narrower than the C10 reflector and lens, so the mounting tabs would have to be modified to properly support the assembly behind the lens. It arrived today and I was anxious to see how it worked in the KLR, so I did not pull the C10’s lens to temporarily stick it in and try it. I will tell you this – it is a bright sucker, in both tail and stop (strobe) modes, and there is tremendous brilliance differential between the two as well. Even being narrower, I have no doubts that it’s LED array will properly illuminate the backside of the bike to where it is very conspicuous. Rather than disturb the one I have in place, I may opt for another for the C10 once next month’s allowance comes in. Moderators, if this enough of an off-topic discussion, move if necessary. I assume one (1) module took care of both LED lamps? I think you are all talking about the unit made by Gizmomill. I have one on my 2003 Connie and I love it. Scares the crap out of everybody behind me. I have had several motorcyclists comment on its attention-getting ability. It flashes for slowly for about 2 seconds, then really fast for another couple of seconds, then goes steady. That way, when you are sitting at a stop light with the brake on, it doesn't really piss off the poor guy behind you with a constant seizure-inducing strobe. As stated above, they appear to be no longer available. I put HyperLites on my Wee-Strom, and they are slowy losing individual LED's. When they are gone I will find some cheaper replacements. There are a lot of economical LED lights available, that could be paired with different types of flashers. Think I am basically done with the LEDizing of the KLR. The LED 1156 replacements for the license plate illumination came in yesterday, so I replaced it. So far, so good. The muted illumination provided by the original incandescent has been replaced with a whiter brilliance. 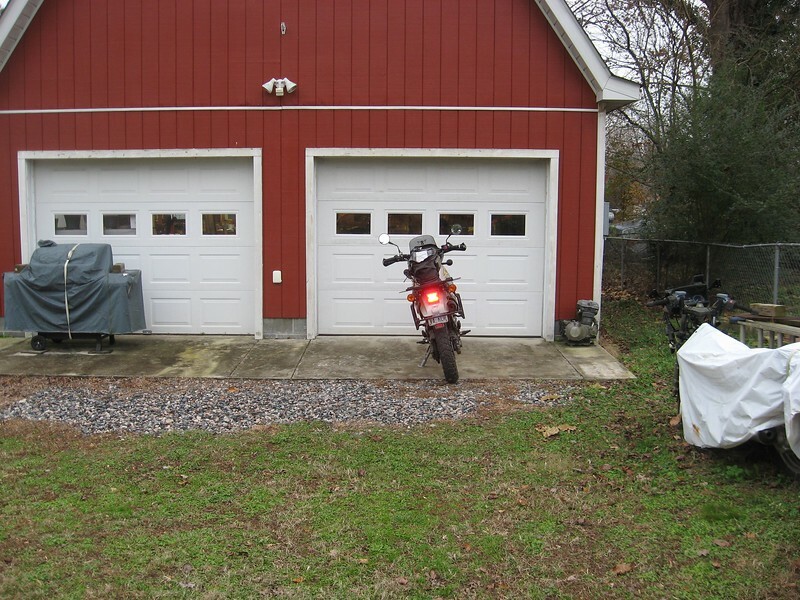 The LED plate bulb was in place for the in front of the garage shots, and we were about 25 feet back from the bike. No brakes were applied for the plate shot in the garage. We may eventually try some of this technology to the C10, but for now: That's all folks.